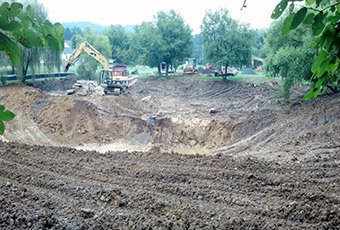 Hanover Engineering was retained by Mary P. Greiss-Coult to redesign an abandoned trout hatchery pond located on her property in Lower Milford Township, Lehigh County, Pennsylvania. The 1-acre hatchery pond had a concrete bottom with maximum depths of 2-3 feet and was no longer being fed with clean, cool water from an adjacent stream channel. As such, the pond did not provide any desirable values such as recreation, aesthetics, and wildlife or aquatic habitat. The owner’s ultimate goal was to create a pond which provided those values, with an emphasis on being a healthy aquatic ecosystem, and not just another stagnant shallow pond. Like all water-dependent projects, there were challenging environmental issues and site constraints to navigate. After studying and documenting wetlands, potential endangered species conflicts, floodplains, access areas, and regulatory requirements, Hanover Engineering conducted detailed land surveying, completed engineering designs for access and construction, prepared permit applications, obtained all regulatory clearances, and assisted the owner with contractor selection. Pond depths were maximized to a depth of 15 feet, with side slopes incorporating benches for aquatic plants and fish habitat. A planting plan was developed using desirable native species for the shallower water areas, including gravel beds for fish spawning and rock piles as structures for shelter. The plan also included a small sandy beach and floating dock. A coldwater bypass with ball valve was designed and installed to route clean, cool water to the pond from the adjacent stream channel. Eroding sections of the stream’s banks were also repaired, with the plan utilizing large native stone for structural stabilization of the lower banks and native plants to hold the upper banks.